In developing the exhibition concept we had one important challenge to face: we only had one of the four original paintings to exhibit, whereas in Tallinn visitors were fortunate to experience all four versions of the composition side by side for the first time. In order for us to tell and show all the stories linked to these four paintings and the preceding research project we had to re-think our traditional way of making exhibitions and we decided to engage twenty young art pilots from the ULK Art Labs for Young People who co-operated with conservators and staff members from the Gallery’s education services. Their co-operation has resulted in a different kind of exhibition where visitors can explore not only the research results behind the project on five touch-screens, but also enter and discover the workshops of both present-day conservators and sixteenth-century painters. The ULK Art Labs for Young People is a creative laboratory and social community for young people, set up by the National Gallery of Denmark. The art pilots are young volunteers who provide the Gallery with advice on how to target peer-to-peer education and communication activities aimed at young people. 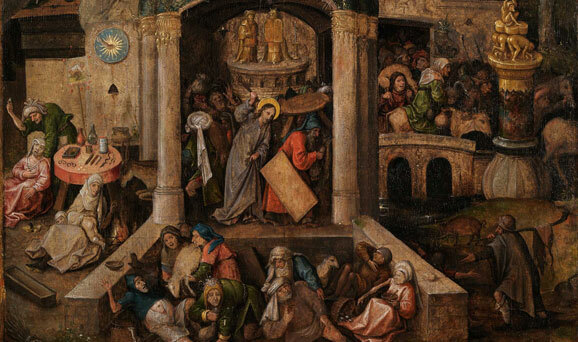 Illuminated – tracing Bosch and Bruegel takes its starting point in a group from twenty art pilots who set off by exploring the conservators’ world, following them through the process of analyses that resulted in new discoveries about the four paintings. Museum guests enter the exhibition through UV light and face a wall covered with a detail from the temple in the Copenhagen version – half shown in UV, the other half as an infrared reflectograph. Behind this wall the visitor meets a conservators’ workshop where life-sized reproductions of the four paintings are shown – one of them standing on an easel lit up by a restorers' lamp and with a trolley next to it showing the various brushes and retouching equipment necessary for a conservator during the restoration process. The room is filled with historical pigments, solvents, empty frames and white gloves. You feel the work in progress. A Leica microscope is available for the public in order to study a tiny paint cross-section – also shown as a live video on wall-mounted monitor. From the conservators’ workshop the visitor enters the second room of the exhibition and meet our Keeper of Conservation Jørgen Wadum in a life-sized film projection on the wall. 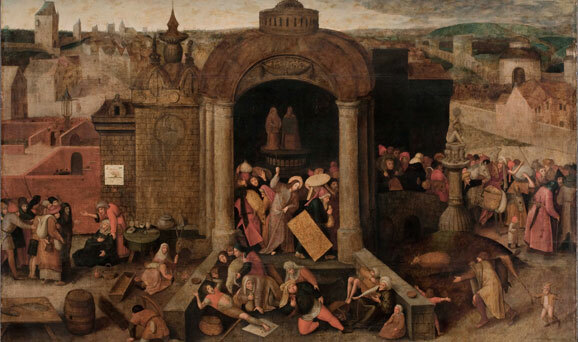 Jørgen Wadum tells about various tools and materials which can be seen in the exhibition and which relate to both the conservators’ and the sixteenth-century painters' work. The visitor is now in the painters’ workshop and can be absorbed in all the research aspects of the project by using five touch-screens. One wall shows the enlargement of an old print of seventeenth-century painters’ studio and the original Copenhagen painting is on display in the middle of the room, on an easel. A film on dendrochronology is playing and the process of a tree becoming a painting support is illustrated. In the middle of the room a wooden plank functions as an absorption-table where the visitor can dive into related literature on historical painting techniques. 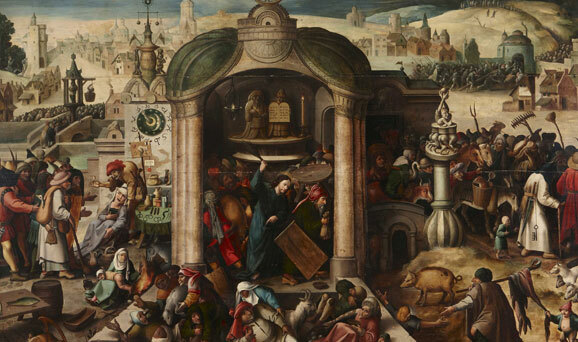 The exhibition Illuminated – Tracing Bosch and Bruegel will be on show at the National Gallery of Denmark until October 21st, 2012. 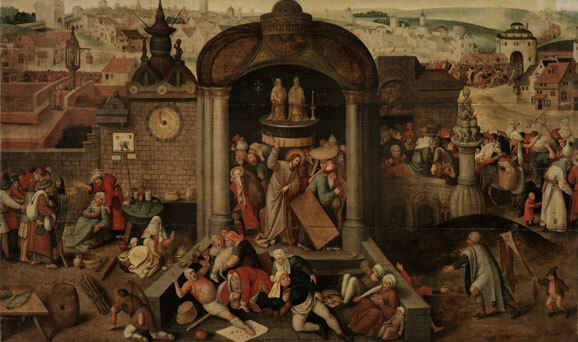 Inspired by the European project Tracing Bosch and Bruegel. Four Paintings Magnified (www.bosch-bruegel.com/), this conference aims to explore how the art historical and technical examination of paintings in tandem can address key subjects, such as meaning, materials and manufacturing techniques, as well as be a catalyst for fresh perspectives on prevailing European workshop practices when copying, replicating and emulating paintings in the fifteenth to eighteenth centuries.